Obituary – Schieffer, Walter Matthew Sr. « Perry High School Alumni Association, Inc.
Obituary – Schieffer, Walter Matthew Sr.
– 18 years, son of Mr. and Mrs. C. J. Schieffer was born March 23, 1923, in Perry, but has attended the Perry schools for only five years. He formerly was a student in the Cooper, White, Pleasant Valley and Hayward schools. Walter was watchdog for the F.F.A. chapter here for two years, and has been active in F.F.A. and 4-H club, work. He has taken part in some high school wrestling and appeared in the junior class play. He plans to farm after graduating from high school. Walter Matthew “Walt” Schieffer Sr., died at 10 a.m. Saturday, Jan. 24, 1998 at his home in Perry. Funeral will be at 2 p.m. Wednesday at Calvary Baptist Church with Rev. Roger Dunn, pastor, officiating. Burial will be in Grace Hill cemetery under direction of Brown Funeral Home. Casket bearers will be Russell Schieffer, Peter Schieffer, Jonathan Taber, Cody Roth, Matthew Schieffer, David Henry and Louis Karns. Named as honorary casket bearers are Neils Anderson, Allen Wilson, Jack Lewellen, J.W. Shepard, Ron Baetz, Dwight Rymer, Wayne Casteel and Roger Layne. Schieffer was born at Perry on March 28, 1923 and was the son of Christ Joseph and Anna Mae (Neuerburg) Schieffer. He was a graduate of Perry High School. On April 29, 1946, he and Bernice Voise were married at Perry. He and the former Erna Inselman were married at Perry on Nov. 22, 1976. Schieffer served with the United States Army Air Corp during World War II and the Korean War. During World War II, he flew cargo planes in Burma, flying over “the hump” with supplies, troops and equipment. After his discharge from the Air Corp, Schieffer served in the Reserves. He was reactivated for the Korean Conflict and was a jet pilot instructor. From 1951-53, he was stationed at Air Force bases in Oklahoma, Alabama and Texas. He was awarded the Air Medal with three oak leaf clusters and the Distinguished Flying Cross with two oak leaf clusters. Between his military years, Schieiffer was employed by V &V Equipment and McLaughlin-O’Neil Oil Service. He raised cattle on a farm six and one-half miles east of Perry and worked as a contract pumper before becoming employed in the shipping department of The Charles Machine Works, Inc. in 1968. Schieffer drove the first CMW company owned truck around the United States, picking up engines and various parts and assisted with dealer transfers and setup. Schieffer was affiliated with the Baptist church, was a member of the American Legion and a charter member of the National Aviation Hall of Fame. 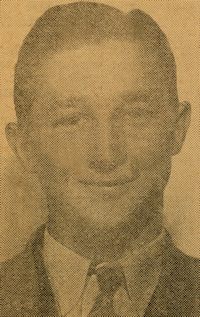 In addition to his wife, Erna, of the home: survivors include four sons and three daughters-in-law, Dennis Schieffer, Enid, Weldon and Sherri Schieffer, Stillwater, Wally and Sherri Schieffer and Bob and Beverly Henry, all of Perry; three daughters and and sons-in-law, Marilyn and Larry Taber, Tonasket, WA, Ranay and Martin Roth, Perry, and Carolyn and Mark Nelson, Orange Park, FL ; 19 grandchildren, one great-grandchild; and five sisters, Audrey Kukuk and Lillie Kukuk, both of Perry, Teresa Ann Rogers, Roseburg, OR, Christina Schnieder, Salina, KS, and Marie Ewy, Kildare, OK and a number of nieces and nephews. Memorials may be made to the Judith Karman Hospice or the charity of the donor’s choice, in care of Brown Funeral Home.